Have you ever been out, running errands, and you suddenly get the feeling that you've forgotten something important, but then you immediately find it and everything turns out okay? If that sounds familiar, then you might have a little angel watching out for you. 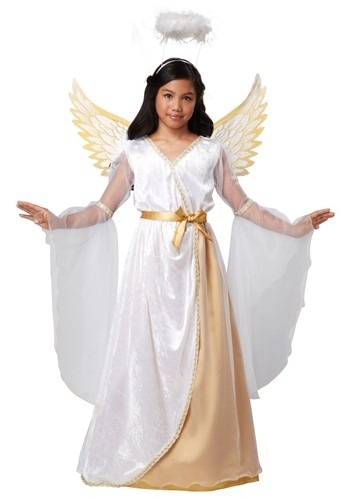 Or, it could even be your girl helping out while wearing this majestic Guardian Angel Costume! But that's what guardian angels are there for, to worry about that stuff so you don't have to. And they look marvelously graceful while they're at it, just like your little angel does in this costume! The shimmering white velvet and gold ribbon trim and belt give this dress a divine shine, while the included wire-framed wings and feathery halo complete the angelic ensemble. It's a positively blessed style for your angel to wear to a holiday party, pageant, or while keeping an eye on you! The wings are nice and special but we were a bit disappointed with the dress. 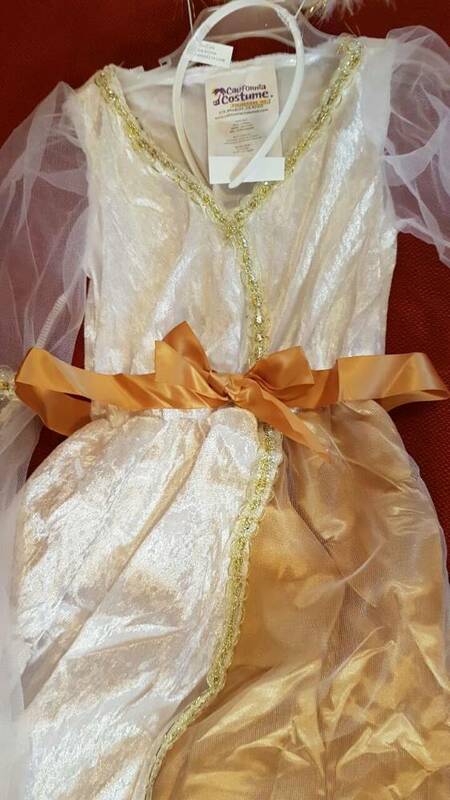 We expected a higher quality (for example, the golden ribbon on the waist is way too long and it's sewed on so it's hard to fix). Thank you for this feedback! You're right, that ribbon is much larger than the waistline and it is sewn in such a way that it can't be tightened from what I can see. I will make sure to pass this along, and again I appreciate you taking the time to review the costume! The wing's wing span was too far they were getting caught on other children's costumes. Had to point them up higher and it didnt look as sweet and whimsical as the pictured angel did. My daughter did love the costume and it was long So she could where long pants and a white shirt under it to stay warm. Over all it was a good quality and a great price ! Nice costume! Fits well and accurate to size chart. Very nice costume and high quality. My daughter is very satisfied especially on the wings.